Although no major U.S. carrier will start offering the BlackBerry Z10 until mid-March, the smartphone can already be purchased through a little-known MVNO called Solavei. The virtual carrier, which has been offering its services since September of 2012, rides on the T-Mobile network and provides 4G (read: HSPA+) data access to its subscribers. 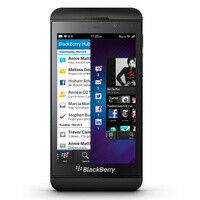 However, the privilege of owning a BlackBerry Z10 before anyone else in the U.S. will cost you. Solavei has the smartphone listed for $999 on the page of its retail partner GSM Nation, which is better than what it costs on eBay, yet still too much to make sense to most of us. For those interested in Solavei's services, the MVNO has its unlimited mobile plan with 4GB of full-speed data priced at $49 per month. That's not too bad considering that one can bring their own unlocked smartphone and doesn't need to sign a long-term contract. Solavei also has a referral program that may shrink your bill or even help you make cash in exchange for bringing new subscribers. $999??? LOL. Is BlackBerry smoking crack? Nowadays you have to play a grand for "a piece of crap". Are there still bb fans out there???? I would not pay a dollar for crap!